On this tour, your experienced guide will drive you to see the main monuments of the city as well as a private visit to the Orsay museum, the impressionist headquarter. Your Licensed English-Speaking Guide will pick you up in front of your hotel or apartment in a private, luxury vehicle. You will have the opportunity to talk to your guide and he will create a personalised itinerary for you before departing. Our guides love to take time before starting the tour to give you a thorough introduction to the history of Paris and to make sure that the day’s agenda perfectly matches your desires. 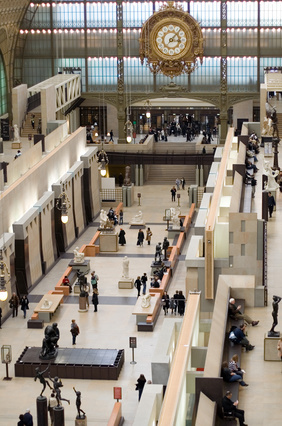 Your morning will begin with a visit to the Orsay museum. Thanks to your guide, you will skip the long lines at the museum’s entrance and you will learn about the interesting history of the building which was an old train station built in 1900 for the World Fair. Today, the museum’s collection spans the artistically revolutionary era between 1848 and 1914. You will first explore the ground floor of the museum which features paintings, sculptures and decorative arts from 1850 to 1870. To continue chronologically, your guide will lead you to the upper level dedicated to the impressionists where you will enjoy an amazing view of the city before marveling at some of the most beautiful works of Monet, Renoir or Degas. Lastly, discover the middle level with the post-impressionists Gauguin, Toulouse Lautrec, Seurat, Signac and Van Gogh. 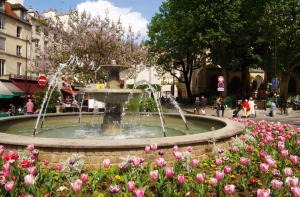 To complement to your visit, you will then visit Montmatre, the artist’s district where you will see and feel first-hand the atmosphere that inspired some of the artists you just admired at the Orsay museum. Discover the Abesses District (the real Montmartre for the locals with its charming food market) and The Moulin de la Galette (painted by Renoir and Van Gogh when they lived there at the end of the 19th century) Stop on top of the hill of Montmartre, enjoy a walk in the narrow, cobblestone street of this picturesque village nestled in the heart of Paris and observe painters on the Place du Tertre. 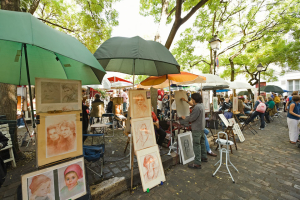 With its many artists setting up their easels each day, the Place du Tertre is a reminder of the time when Montmartre was the mecca of modern art. Finally, you will admire one of the best views of the city before entering the Sacré Coeur Basilica. 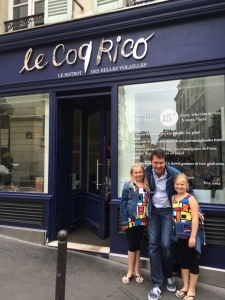 Next, you will enjoy a delicious lunch (not included) in a typical french bistrot where we will have made a reservation in advance. Your guide knows all the authentic and local restaurants away from the tourist crowds, so he can best advise you with your selection. Depending on the weather, you may opt to buy bread, wine and cheese in one of the best specialty food shops of Paris and enjoy a picinic lunch in one of the city’s hidden gardens. Sit Back and Relax !!! Lastly, you will continue your tour around Paris through the Marrais, the City Island and the Left Bank to see all the majors sites. Your guide will also stop for photos anywhere you wish. At the end of the day, your guide will drop you off at your hotel, or wherever you wish, in Paris. Tickets to Orsay museum are not included.